Our dispensing guns range from simple hand-held guns for single and two-part materials, to accurate syringe dispensers. 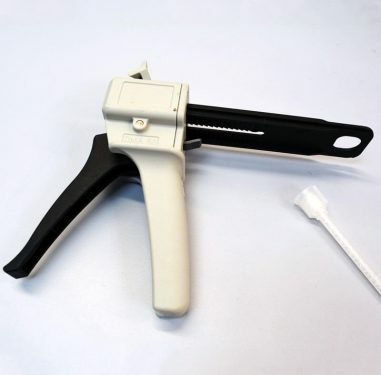 INTERTRONICS SyringeGun dispensing guns are a low cost, high quality, lightweight hand tool designed to dispense materials from standard syringe barrels in an easy, portable and controlled fashion. Its unique design allows it to handle a range of syringe capacities. IDM 310ml Cartridge Dispensing Guns are professional air dispensing guns designed for use with 310ml adhesive/sealant cartridges. Effortless to operate with minimal trigger pressure, these guns provide great benefits over manual ones. The Autotube Dispensing System was designed to dispense any liquids, pastes, greases, silicones or similar liquids directly from their collapsible “toothpaste” tube. The Micro-Dot™ hand-held syringe dispenser delivers accurate and consistent fluid deposits from pre-packed 3, 5, and 10 ml disposable syringes. This portable syringe dispenser can be set to dispense a wide range of fluid shot volumes.